A Steamy Taiwanese Hotpot Affair! My little one loves hotpot or steamboat. We do dine out quite often for hotpot since the little fella always request for this. I will admit I am quite a hotpot snob though because I prefer to patronize premium hotpot restaurants. Since it’s a simple cooking process of enjoying fresh ingredients cooked in soup, I like to savor fresh ingredients than all the processed stuff. In addition, I also prefer better quality soup than those laden with msg in the cheaper hotpot places. 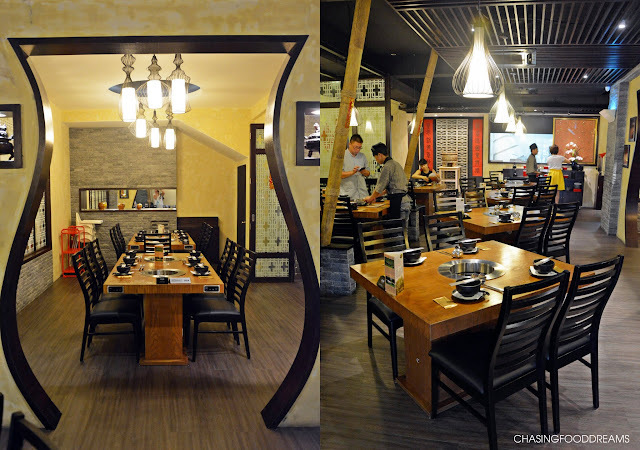 That said, we came across Ding Emperor in SS2 serving up premium hotpot with affordable prices recently. 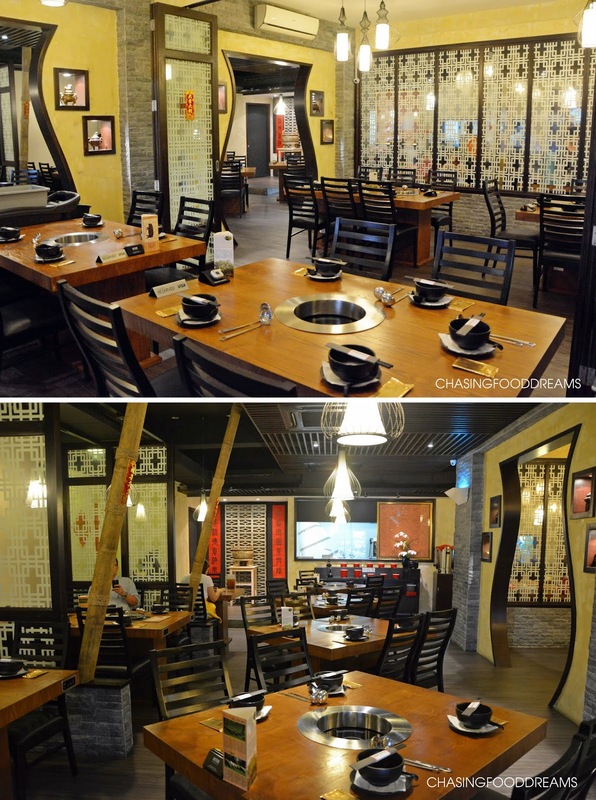 Ding Emperor Steamboat restaurant opened last November and has been serving their signature Taiwanese style hotpot together with a list of premium ingredients on their a la carte menu. The restaurant also imports in special premium ingredients like Meltique beef, Iberico pork and Abalone for those who loves these lavish treats. There are also plenty of regular ingredients together with homemade balls as well. What makes Ding Emperor different from other hotpot restaurants is their signature sauces as well. Ding Emperor serves up various sauce condiments as well as their special chili sauces to go with the hotpot. Ding Emperor’s décor echoed its name in grandeur. Dressed in a theme of black and gold with wood, the restaurant is nicely sectioned in several dining areas for privacy. Oriental motifs on glass and wood panels, arched doorway, bamboo poles, slate tiles and modern lighting completed the interior of the restaurant. Elegantly designed, diners can certainly enjoy premium hotpot in comfort and style. There are two signature soups available at Ding Emperor, Hot Pot Chinese Cabbage and Hot Pot Spicy. You can order single soup on its own or go for the Hot Pot with Twin Flavours (RM18.00) like we did. The Hot Pot Chinese Cabbage soup has a creamy milky consistency with a lovely sweetness from the Chinese cabbage and fresh tomatoes while the Hot Pot Spicy is quite a fiery Ma La kind of soup enhanced with lots of aromatics. We helped ourselves to the various condiments and sauces as our ingredients arrive. I mixed chili oil, crushed chili, sesame sauce, coriander, spring onions and soy sauce for mine. I love the sesame sauce as it really enhanced the chili with a creamy and aromatic taste! I really enjoyed their homemade balls. We had their Handmade Squid Ball (RM8.90 – 4pcs) and Handmade Pork Ball (RM6.90) – 4pcs). Both are delicious with firm bouncy textures. Other choices of homemade balls are Handmade Chicken Balls (RM5.90), Handmade Fish Balls (RM5.90), Handmade Shrimp Balls (RM8.90) and Handmade Beef Balls (RM8.90). We also had their homemade Abalone & Fish Paste (RM17.90) and Shrimp & Fish Paste (RM15.90). These are really good too with a softer texture. There is another one with Scallop & Fish Paste too. Another must-order item are the Dumplings (RM8.90 – 4pcs). Also homemade, the filling is tasty and bouncy. We loved this so much we had another order of this dumpling. There are some other unique processed balls like Tofu Fancy (RM6.90) and Salmon Wrap Sausage (RM6.90) and these were not too bad. Our highlight of the night was their meat. Ding Emperor serves premium meats and we had the Iberico Bacon Belly (RM29.90), Iberico Collar (RM29.90) and Australian Meltique Beef (RM29.90). The Bacon Belly is quite fatty but when cooked in the broth, the fat turns a nice creamy and firm texture. The Collar is one best cut of pork I had as there is a good ratio of lean and fat so the meat is very tender and flavourful. If you have never tried Meltique Beef before, you should. It is said to be equivalent to the premium Kobe but is named differently because it is not from Japan. The price tag is totally worth it once you had a taste of these special premium cuts of beef and pork. Other hotpot ingredients we had that evening are Bean Curd Skin (RM4.90), Frozen Bean Curd RM6.90), Handmade Celery Noodles (RM4.90), Brown & White Shimeji Mushroom (RM6.90) and Yin Choy (RM5.90). The Frozen Bean Curd is a favorite of mine and though it’s not popular over here in our country, it’s quite a favorite in Taiwan and China. The texture is rather unique as the bean curd purposely freeze to achieve its texture. The noodles are also pretty good as these are handmade as well. Besides the hotpot, there are some appetizers that one can enjoy while waiting for the hotpot such as Fried Meatball (RM8.90) and BBQ Chicken Wings (RM15.90 – 6pcs). We really enjoyed Ding Emperor Steamboat as the broths and ingredients are certainly top-notch quality. I also didn’t feel thirsty after my meal, another good indication of no msg in the broths. Plus points for the delicious sauces as well. It’s a good place for family and friends dining with premium steamboat ingredients. totally far from the real one in taiwan.